Click a question below to read the answer. How does 3 compare to other beverages? At (50mg/half liter), 3 contains substantially less caffeine than brewed coffee (250-350mg/half liter), energy drinks (160mg/half liter), Mountain Dew (75mg/half liter) and even green tea (80mg/half liter). In fact, it’s about the same level as Coca-Cola (45mg/half liter). What does 3 taste like? Like delicious, refreshing pure spring water. What type of water is 3? The water of 3 is so pure that it technically qualifies as purified by FDA standards directly out of the spring because of naturally-occurring low Total Dissolved Solids (TDS) of less than 10 PPM (Parts Per Million). The spring water tests as (ND) by the most trusted source in annual testing which indicates “None Detected.” The pure spring water is also triple micron filtered and ozonated for the best, freshest possible taste. Electrolytes are essential to the cells in your body (especially muscle, nerve, and heart cells). They’re electrically-charged ions that maintain your ‘life-voltage’ and carry the electrical impulses that control your every move and thought. When you lose electrolytes through your sweat, even from normal every day activities, they must be replenished to maintain a healthy body-fluid balance. Electrolytes perform many vital functions in your body. When you lose too many of these precious minerals, it begins to affect the proper functionality of your body and mind. This delicate balance of fluid-control maintains practically all of your body’s functions and can be easily disrupted, by even mild dehydration. What kind of electrolytes are infused in 3? Calcium Chloride, Magnesium Chloride and Potassium Bicarbonate. How much caffeine does a bottle of 3 contain? Each 500ml bottle of 3 contains 50mg of natural caffeine (about the same as in a half cup of coffee). 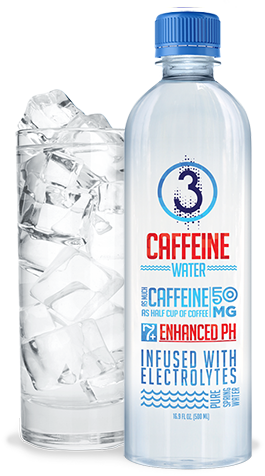 3 contains all natural caffeine derived from fresh, green coffee beans. How much caffeine is safe to consume per day? pH is a scale measuring acidity and alkalinity from (0 to 14) with (7) being neutral. Higher numbers represent alkaline and lower numbers acidic. Human blood has a normal pH level of (7.4). 3 water is pH Balanced (7+) to help your body fight free radicals, flushes cell toxins and prevents new toxins from accumulating. When your pH levels are not properly balanced you can’t process essential minerals and nutrients appropriately. Our cells need to be slightly alkaline to function properly. Bacteria, diseases and viruses thrive in acidic, but struggle to survive in alkaline. When you drink 3 you increase alkalinity and immediately start fighting back against these adverse conditions. When is the best time to drink 3? Morning – instead of reaching for that sweetened, high-caloric coffee, why not drink 3 to start your day? Afternoon – feeling that 2pm crash? Why not grab a 3 and finish up the rest of your work day productively? Before your workout – 3 is the perfect pre-workout drink, it keeps you focused, motivated and hydrated. Anytime – our healthy beverage experts strategically formulated 3 with the perfect amount of caffeine, to keep you focused and productive throughout the day. Who should not drink 3? Women who are pregnant or nursing, and children under 10 years of age. Where can I purchase 3? Click FIND 3 to locate 3 in your area, or you can BUY 3 directly from our online store.